These are two very different types of documents. Presentation documents are meant as audio-visual aids to reinforce your talk – watch a few excellent Ted talks, like this one from Rachel Botsman to see how visuals reinforce her talk. And I highly recommend you read The Presentation Secrets of Steve Jobs. See my post about this highly useful book. 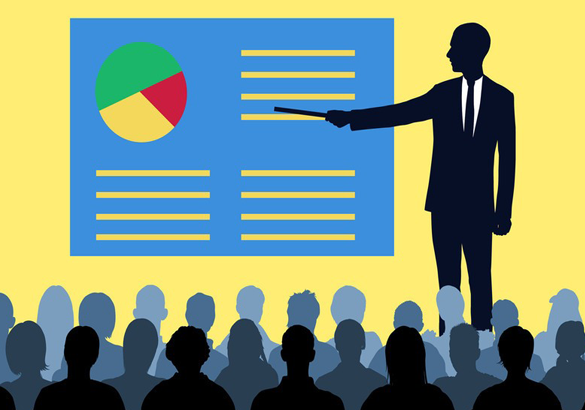 No presentation document is meant to standalone – it is a supplement to your talk – after all you want people to pay attention to you. Otherwise, why not just hand out your presentation to your audience and let them read it! Leave-behind documents are by nature meant to standalone, you won’t be there to flesh them out or answer question, so they need to be complete and free-standing. And each page can be and probably should be far more detailed than your presentation slides. So the best strategy is to do both: have a great audio-visual presentation with graphics, animations and even audio and video that illustrate and reinforce the points you make in your presentation AND have a handout that you can email, post on your site or otherwise disseminate that’s meant to be read or at least perused at the audience’s leisure. Of course, if you have a TED-quality professional video of your presentation you can kill two birds with one stone by just providing a link to a post of that video. In any case DON’T FORGET to include your contact information in your documents!